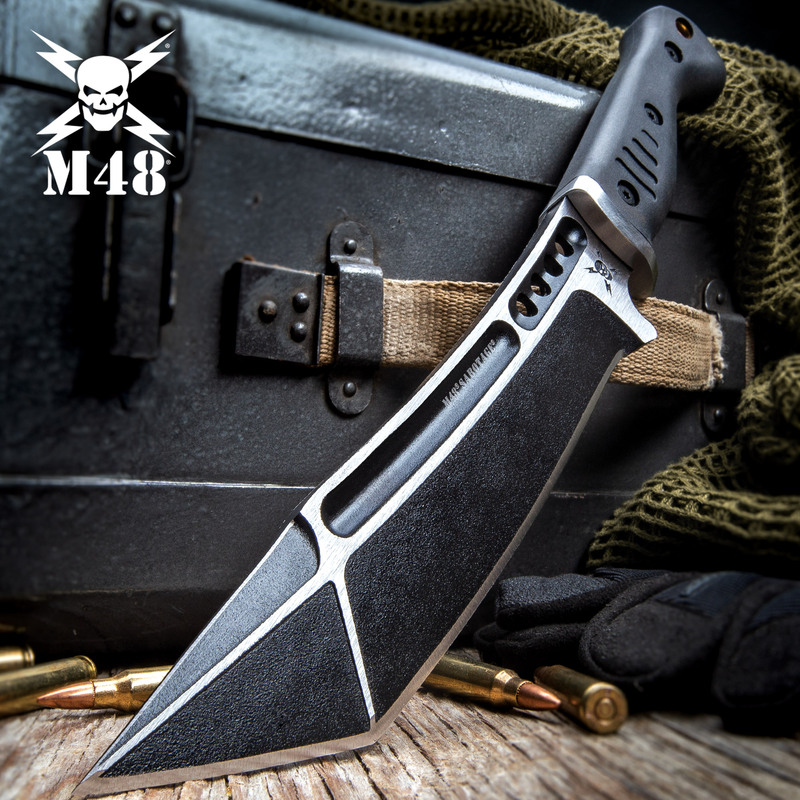 The M48 Sabotage Tanto Fighter presented by United Cutlery is a special breed of tanto knife that is the best you can get out there today. 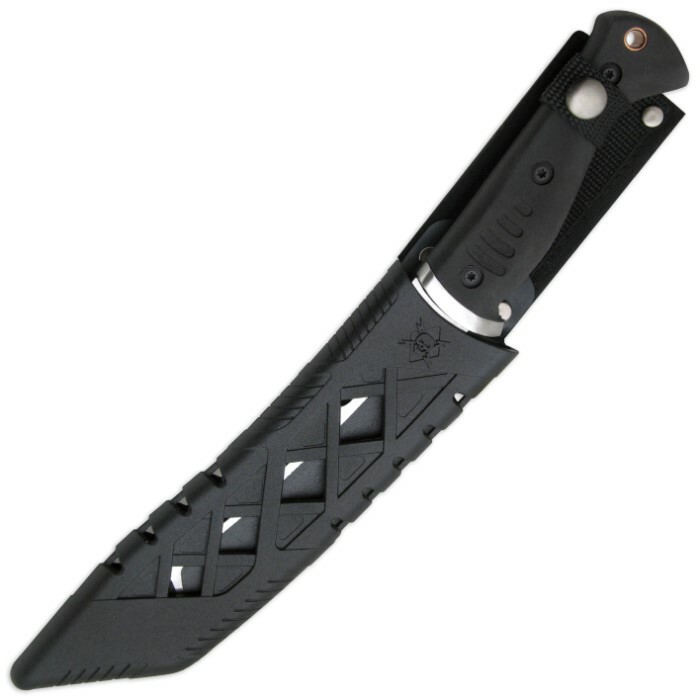 It has a triple-beveled blade with a bead-blasted black oxide finish. The handle is injection molded TPR for a non-slip grip. A belt sheath with a rubberized blade cover completes the package. It arrived nice and sharp and I put it to the test the same day. Chopped through pallet wood easily as it did 2 inch branches. The blade nearest the handle was sharp enough to shave wood to make a fire. It sliced cardboard and old paneling easy enough that there was no struggle to get the blade down and through. The handle held up to pounding in a few makeshift tent stakes, and then was battoned to make kindling out of 4 inch branches. It held up for every test and still only needed touching up to sharpen it. A good working blade. It will go camping with me on my next outing. I might write again to let you know if I use it to clean game or do food prep. 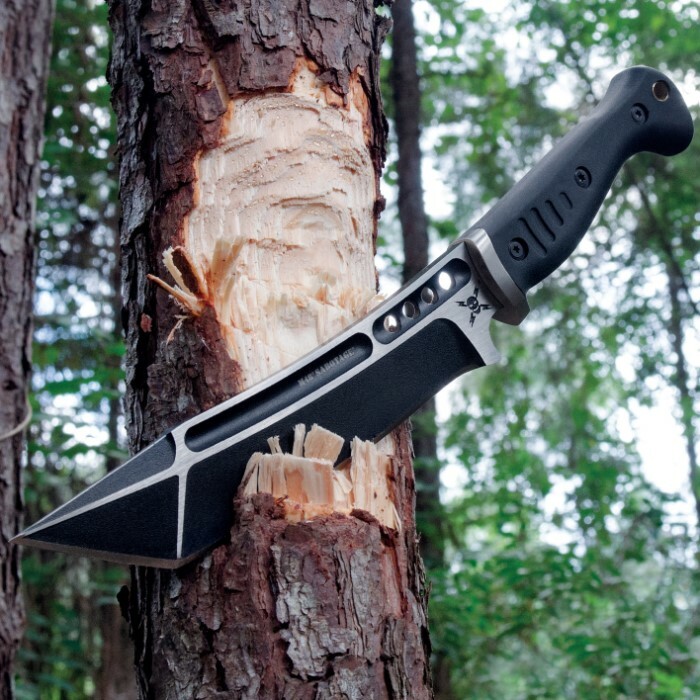 Seems like a most excellent addition to my outdoor adventures kit, might even replace my hatchet. This knife is awesome! Its a half inch thick and with a little love it will take a razor edge. Buy this knife! I received my blade today. Beautiful! The comment about the blade or "belly" not being sharp enough is true. BUT, anyone who really knows about a Tanto knife knows the belly is never razor sharp. A Tanto knife is made for piercing, not slicing. I couldn't be more pleased. Any knife collector needs this in their collection. I'm thinking about getting another one. Also, I am very pleased with True Swords. I had no problems at all. It was delivered a day early. I will be purchasing 'knives' from this company again.. This is a beefy blade. M48 is doing it right. I picked mine up from academy for about $30. I think they were having a sale. I have been drooling for this for a bit and it did not disappoint. Sliced paper sharp. Overall, i have to say this is a great knife. I tried chopping one tree branch maybe a half inch thick and the tang broke. Dissatisfied because this is really a good, unique knife. Got this knife weeks ago. Got a 1" belt sander from H.F. Used 320 grit, then 600, then a leather strop belt. Now "razor" sharp edge. Did this to all my knives in my collection some from BudK and others. If you have a knife, keep it razor sharp. Only takes a few minutes using this technique. Very nice. Well made. Sharp point, sharp blade. Good balance . A mans knight. Great knife to add to any collection or for practical use. Heavy thick blade, sharp edge, well balanced, good solid construction. Sheath is hard plastic material but adequate for carry. 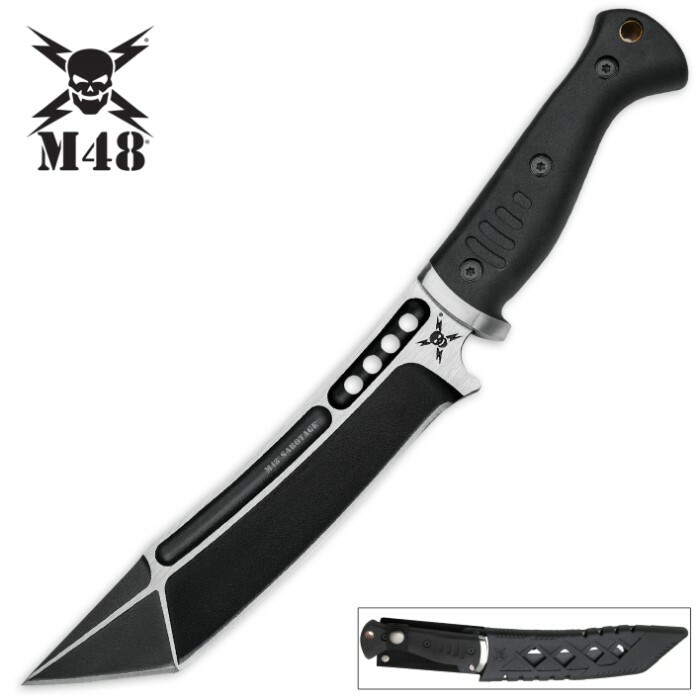 I can not remember the last time i spent 50.00 bucks and got a great product like the M48 SABOTAGE TANTO FIGHTER - it is a piece of art !! - well made - heavy duty - and just plain great to handle !! 5 star all the way !!! It would be a great deal at 2x the cost !!! Well done guys! !